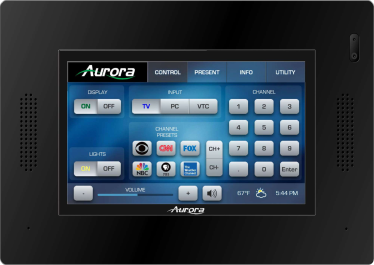 New products from Aurora - InfoComm Recap - Aurora Multimedia Corp. Thanks to all that visited the Aurora booth last week at InfoComm 2015. It was great meeting with all our dealer partners, consultants and end users who stopped by. 2015 was another record breaking / award winning show for the company: the V-Tune Pro 4K took 1st place for Video Distribution Systems in the 2015 CI Best Awards at InfoComm 2015, and IPBaseT IPX-TCW3 4K Transceiver Wall Plate was awarded the Best Of Show at InfoComm 2015 award. Below is a review of the new products we showcased in the booth. For further information or to schedule a personal demo, please contact us directly or our international distribution partners for those who visited from outside the US. Leveraging Aurora’s IPBaseT™ Technology, the award-winning IPX series transceivers are the market’s first 4K transceiver with zero compression and zero latency. Combining the ability to use the unit as a transmitter or receiver, the solution greatly simplifies overall system design, ordering, stocking, and deployment. Don’t be fooled by the appearance – the IPX series transceivers are not point-to-point extenders. Combine as many units as you need on a 10G network to create a nearly limitless “distributed matrix” system. Place transceivers at your sources and at your displays and they link up automatically to provide you with uncompressed 4K video distribution. Aside from the simplicity of the system design, installation, and troubleshooting, all IPX units come complete with a video wall processor and a control processor built in – at no additional cost. TA/Broadcast or streaming content from local area networks. Users simply switch between content by changing channels – providing cost-effective solution for any rich media application. 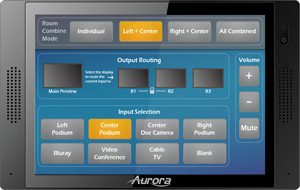 Aurora’s innovative QXT quad-core HD touch panels are a platform-agnostic tablet-ready solution embedded with an integrated control processor. Featuring a high resolution screen and 2D/3D graphic accelerator, these units ensure both stunning graphics and a responsive GUI experience for a wide variety of environments. 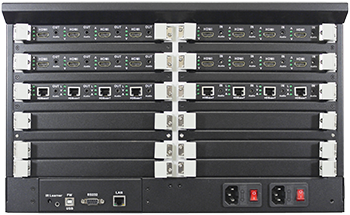 New at InfoComm 2015, DXM third generation Matrix switchers, the DXM-88-G3 8×8 matrix, DXM-1616-G3 16×16, and the DXM-3232-G3 32×32 card-cage matrix systems. Updated to 4K UHD these completely new systems add some major features to the system such as embedding Aurora’s QXT touch panel control engine as the main interface for the matrix.The front panel will now house the new QXT-700 touch panel offering not only control for the Matrix but full control for the entire system adding IP, RS232, IR, Relays and DIO ports directly to the Matrix. 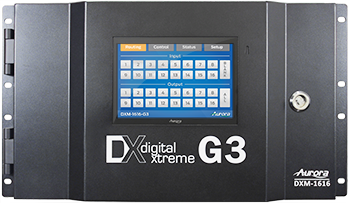 Additional updates include an embedded 1G network switch allowing Ethernet to pass directly over the HDBaseT inputs and outputs for streamlining wiring infrastructure throughout a facility.The DXM-G3 system will also provide PoH (Power over HDBaseT) for all Aurora HDBaseT peripherals (HDBaseT Wall plates and Receivers). The system also adds Audio Breakaway switching giving complete flexibility for multi-zone audio enhancement. rd amplification, relay control and background/paging integration for a complete single cable solution. With the addition of four (4) external audio inputs, additional MIC input with independent volume control, de-embedding line level stereo output and auto sensing/switching video inputs, the DXP-62 is perfect for Classrooms, Conference Rooms and AV Cart applications.